Background: The article describes the institutionalization of farmer participatory research and plant breeding that has occurred in Honduras over the past 22 years and demonstrates how this approach can o er a positive response to climate change and sustainable agricultural development. In Honduras, participatory plant breeding (PPB) involves the collaboration of farmer researchers organized in local agricultural research committees (CIALs), plant breeders, and non-governmental organizations (NGOs). While earlier debates often questioned the role of farmers in agricul- tural research, particularly the synergistic e ect of this role with regard to scienti c research, little empirical evidence was provided to settle this debate. Nor was the contextualization of farmer research adequately addressed. The article responds to calls for studies that detail what actually happens in development practice. Results: The article provides detailed cases of farmer–NGO–scientist collaboration in the development of new bean varieties in Honduras. The documented cases of PPB-generated bean varieties demonstrate how and why this collab- oration has produced synergies for scienti c research and positive bene ts for poor farmers in the Honduras context. Very high adoption rates of PPB varieties compared to unimproved local and conventional scientist-developed varie- ties show the importance of this approach for regions of the world where agro-biodiversity is high and agricultural research budgets are inadequate to address this diversity. Conclusions: PPB provides a means to improving food security in poor and agro-biodiverse countries, such as Honduras. Nevertheless, to incentivize farmers to engage in PPB research over the long term, seed regulatory systems must allow for the development of small seed enterprise. Research support must also be long term. PPB in Honduras has been successful because donor support to both scientists and NGOs for farmer participatory research has been sustained allowing for trusting partnerships to evolve between the di erent players. Humphries S, Rosas JC, Gomez M, Jimenez J, Sierra F, Gallardo O, Avila C, Barahona M. 2015. 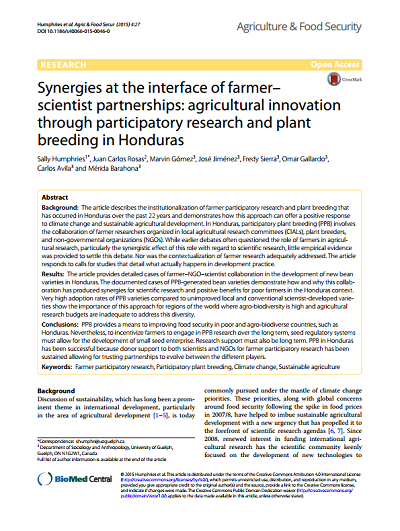 Synergies at the interface of farmer-scientist partnerships: agricultural innovation through participatory research and plant breeding in Honduras. Agriculture & Food Security 4:27.